"Six Nations Land Deal Delayed After Confederacy Chiefs Object"
"A deal between the province and Six Nations council on the use of land claimed by the band along a provincial highway was delayed Wednesday when traditional chiefs demanded a say in the agreement." "Six Nations Asking for Another School Board"
Alkerton, Karolin, Tekawennake News (Ohsweken, Ontario: Tekawennake News, 1968), 9 Feb 1994, p.1, p.4 "Parents of I.L. Thomas Odadrihonyanita Home and School are not prepared to accept the conditions set out in the elected Council's Memorandum of Understanding which proposes to transfer the education of Six Nations students to the Six Nations Education Board." "Chief Coun. Montour, 49, has said he wants more involvement from the regional chiefs in the national lobby group." "George Beaver Charged for Treason - 1959"
Windle, Jim, Tekawennake News (Ohsweken, Ontario: Tekawennake News, 1968), 10 Jul 2013, p.6, p. 7 This article revisits the arrest of George Beaver for treason by the Iroquois Police during the 1959 Revolution in response to a letter to the editor Beaver had written in the Brantford Expositor criticizing the actions of supporters of the Hereditary Chiefs. 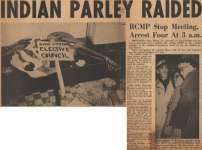 "Land-Use Pact to Continue Despite Confederacy Protest"
White, Vicki, Brantford Expositor, 8 Jun 1991 "The province and the Six Nations band council are planning to continue with a land-use agreement despite opposition by the Confederacy council." "Elected Chief Signs Unity Pledge That Includes GRE"
Duric, Donna, Turtle Island News, 19 Mar 2014, p.2 "Six Nations Band Council has become the first group on Six Nations to sign a 'unity declaration' that one local woman hopes will be the beginning of a new working relationship between political factions in the community." "They All Talk of the Importance of Returning to Traditional Native Values"
Brantford Expositor, 1991 "They all talk of the importance of returning to traditional values, and emphasize the need to improve living conditions in native communities." 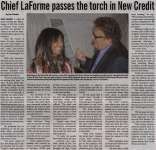 "Chief LaForme passes the torch in New Credit"
Windle, Jim, Two Row Times (Six Nations of the Grand River, ON: Two Row Times), 9 Dec 2015 "After 14 years serving the Mississaugas of the New Credit as Elected Chief, Bryan LaForme has decided to 'hand it up and let somebody else have a go at it,' as he puts it." "One injunction dropped, but other motions against Caldwell chief and council continue"
"Racial Remarks, Threats of Ousting Fuel Hot Band Council Debate"
Duric, Donna, Turtle Island News, 15 May 2013, p.4, p.9 "A Six Nations Band Council discussion on the future of the Burtch lands turned sour Monday when councillors and farmers hurled accusations and racial remarks at the Haudenosaunee Development Institute."